Natural remedies used through the ages abound, especially in Asian medicine. The willow-leaved justicia plant, found throughout Southeast Asia, has traditionally been used to treat arthritis, but scientists have just discovered it contains an anti-HIVcompound more potent than AZT. AZT was the first drug approved to treat HIV, and is still used in HIV combination therapy today. A multi-year research partnership between scientists from the University of Illinois at Chicago, Hong Kong Baptist University, and the Vietnam Academy of Science and Technology was responsible for finding the new compound. They screened more than 4500 plant extracts, looking for agents effective against HIV, tuberculosis, malaria, and cancer. From extracts of the willow-leaved justicia plant, they found patentiflorin A, a compound with tremendous anti-HIV potential. The research study was led by Lijun Rong, from the University of Illinois College of Medicine; Harry Fong, of the World Health Organization Program for Traditional Medicine; and Doel Soejarto, professor emeritus at UIC College of Pharmacy. It was published in June in the Journal of Natural Products. HIV infects CD4 white blood cells, the very cells of our immune system that are supposed to protect us against infections. The virus usually kills the CD4 cells and leaves HIV patients susceptible to infections with all sorts of microbes that don't normally establish an infection in healthy people. HIV is not curable currently. It's treated with a combination of drugs — collectively called anti-retrovial therapy or the 'cocktail' — that hit different stages of the HIV life cycle. 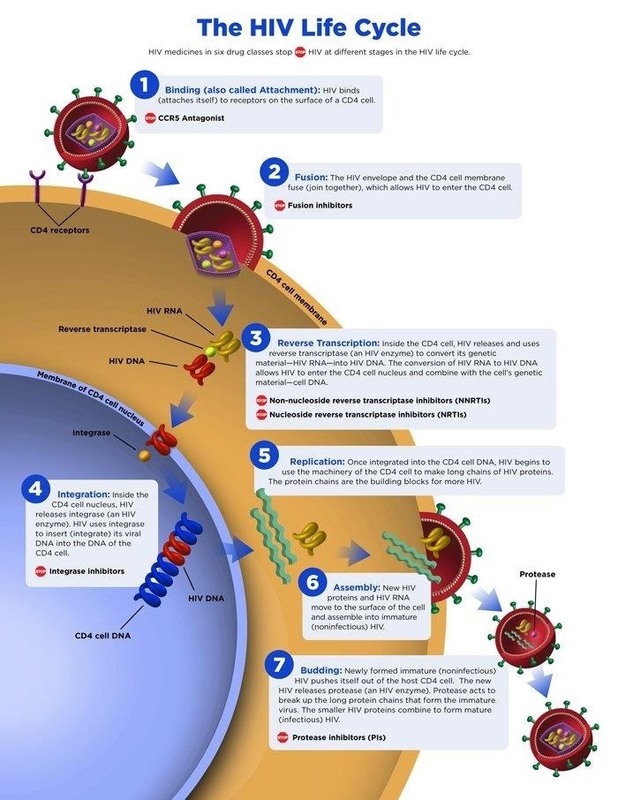 Initial treatment of HIV usually includes three drugs: two nucleoside reverse transcriptase inhibitors plus an integrase strand transfer inhibitor, a non-nucleoside reverse transcriptase inhibitors or a protease inhibitor combined with a booster of cobicstat or ritonavir. Nucleoside reverse transcriptase inhibitors, like AZT, and integrase strand transfer inhibitors stop the HIV virus's genetic material from getting into the CD4 cells' nucleus where it would be replicated. Protease inhibitors help stop the newly-made immature virus from forming infectious, mature particles. These combinations of drugs decrease virus levels so much they can't be detected by lab tests, yet we know the virus is still there. It can persist in a latent stage in the body's immortal CD4 cells, not multiplying, but ready to become active again if treatment is stopped. Over a million people in the US live with HIV, so finding better treatments and even a cure are research priorities. After screening thousands of plant extracts for potential anti-microbial activity, Rong and his team found patentiflorin A, a compound that was a better reverse transcriptase inhibitor than AZT. Patentiflorin A also worked at the earliest stage of HIV infection, before it even attached itself to CD4 cells, and worked against drug-resistant strains of the virus. To prevent depletion of the valuable natural resource — the willow-leaved justicia that has already given us at least two useful medicinals — the scientists found a way to synthesize patentiflorin A in the lab and have an international patent on the product approved in China, Europe, and pending in the US. They are looking for commercial companies interested in manufacturing and testing patentiflorin A further. If we can make the drug in the lab, we don't need to establish farms to grow and harvest the plant, which requires significant financial investment, not to mention it has an environmental impact. Dr. Rong told Invisiverse that they are planning to evaluate these compounds in animals to see if they have the same effects as in their experiments. If those studies are successful, then they will likely move to clinical trials in China where they will be tested on humans, first for safety in small groups of people, then for effectiveness and side effects in many more people. The researchers suggested that adding patentiflorin A to the standard HIV drug cocktail can help suppress the virus even further than the cocktail alone. The ability of the new compound to work earlier in HIV infections means it may even help to decrease the amount of latent virus that escapes the immune system and remains, ready to launch an infection later.